Of all the things that have been most surprising in starting a business, I think the lack of interest in earning new business or retaining existing business I’ve experienced from a number of vendors has to take the top spot. It also makes me appreciate vendors, or companies I am a general customer of, who don’t just do the bare minimum, but go above and beyond. In a world of low-touch interactions and poor customer service, any business has an easy shot at standing out from all the rest. I came across this quote recently and was struck how many different ways it applies to being successful in business. It also reminded me of how much I love companies that I work with that I know will just get “it” done. Whatever it is. I know I can trust them to get it done. If you are starting out as an assistant, be the best assistant there is. You won’t be an assistant for long. If you are in charge of new business, don’t let anything or anyone slip through the cracks or feel like they don’t matter. Trust me, you’ll be at the top of their mind anytime they have to make a decision related to your industry. If they can’t choose you for whatever reason, be it price, timing, etc., they will recommend you to their contacts or network. You won’t be in charge of new business for long, because everyone around you will see how much potential you have to get things done and get them done right. You’ll be in charge of all business, operations, or the company. If you are a customer service representative, each customer should feel like once they call you, you will take care of their problems on your side of the fence. People are way too busy, all the time right now. If a customer calls you and says “I have a problem.” When they hang up, they should feel like 1) it’s resolved or 2) you will personally see to it that it is resolved. If you are a sales representative, don’t make your clients or customers work to give you business. This should go without saying. If you make them work for you, you won’t be a sales representative long – you won’t have a job or, if you are the only representative, your business may fail. If you work your tail off for them, you won’t be a sales representative long – you’ll be in charges of sales, or the company, soon. I strongly encourage you read this article called the $4 Million Complaint Call. In a nutshell, one customer named Bob required an enormous amount of help with a software package, including basic training on how to use the computer itself. While some at the company encouraged the CEO to give up (“We can’t AFFORD to help him – just refund his money and move on”), he didn’t. Six months later, a call came in out of the blue with a new company requesting to standardize their systems on this company’s platform. How did they know they should select this company? 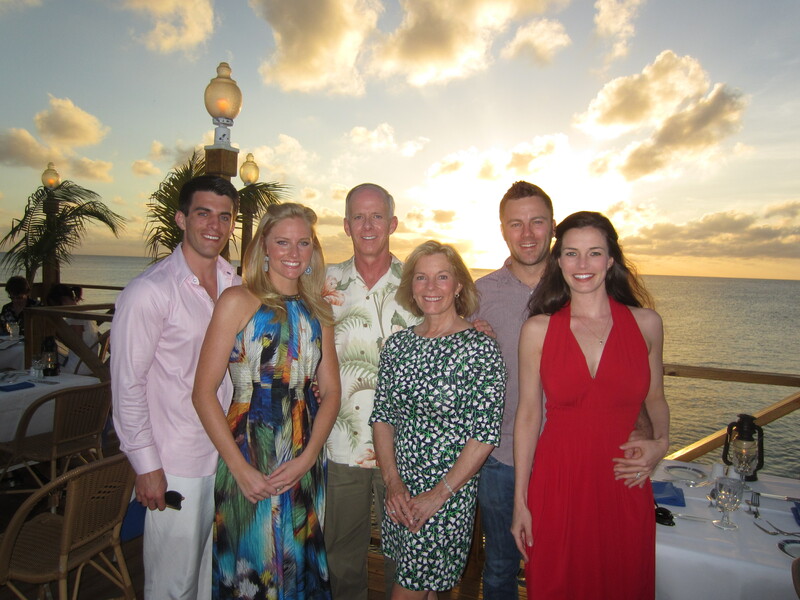 Bob was brought on to their team a few months earlier – he said there was no one better to go with. One final thought: things go wrong. All the time. If something can go wrong, it will. Maybe not now, but sometime soon. Don’t lose yourself. Don’t start cutting down people around you. Just get it done. Be the person that people want to have on their team, as a partner, as an employee, as a boss, or as a friend. People should know that if you’re involved, you are so good, whatever needs to get done, will. 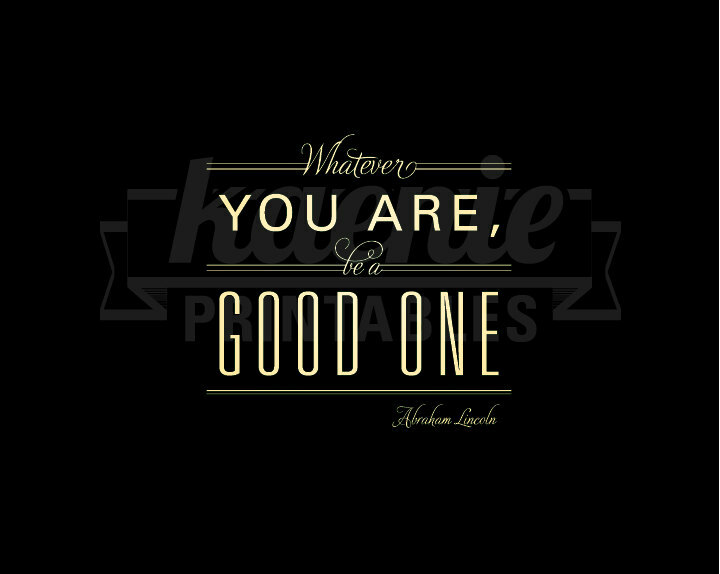 Whatever you are, be a good one. Get things done. Period. Mizzen+Main has made tremendous progress. After going back to the drawing board to make our moisture wicking, wrinkle free dress shirts that much better, we’ve done just that. We have substantially improved the cuffs and collars and made a number of design improvements to the shirts themselves. We’ve taken our redesigned and improved shirts and released them in a beautiful Cornflower Blue and are releasing this weekend an Atlantic Blue Pinstripe and Pink Houndstooth. It’s an amazing feeling to see months of hard work result in such a tangible result. Our first video will be debuted this weekend. The team at Slice Media did an unbelievable job of capturing what we are building – the next great American clothing company. 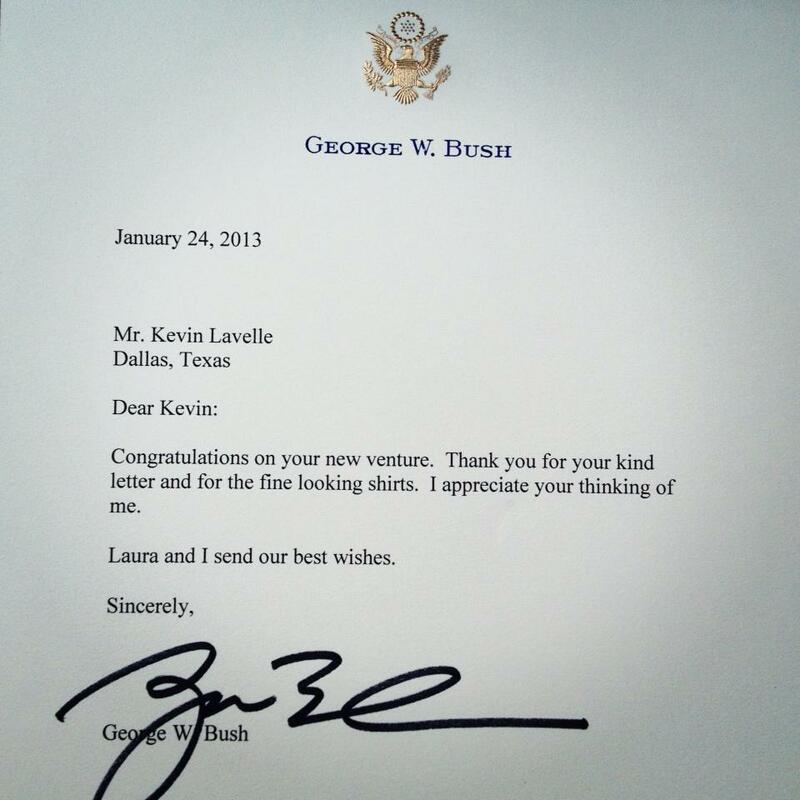 I received a thank you note from President George W. Bush. That was an incredibly significant moment in this journey. I come to understand more and more every day the blessing that it is to work with my two co-founders in building Mizzen+Main, Web Smith and Steven DeWitt. Their talents are overwhelming, and they are two fantastic gentlemen. I have learned more in the last year, particularly the last six months, than I have in 4 years of college and 4 years of working. I heard a quote when I started out on this journey – “Entrepreneurs are the only people who trade a steady paycheck and a 40 hour week for no money and an 80+hour week.” No sugarcoating, add to that investing your spouse, your savings, your emotions, your family, asking for stress 24/7, and asking others to participate on a roller coaster that could have seriously negative consequences for them, and you are beginning to see the picture. So am I. 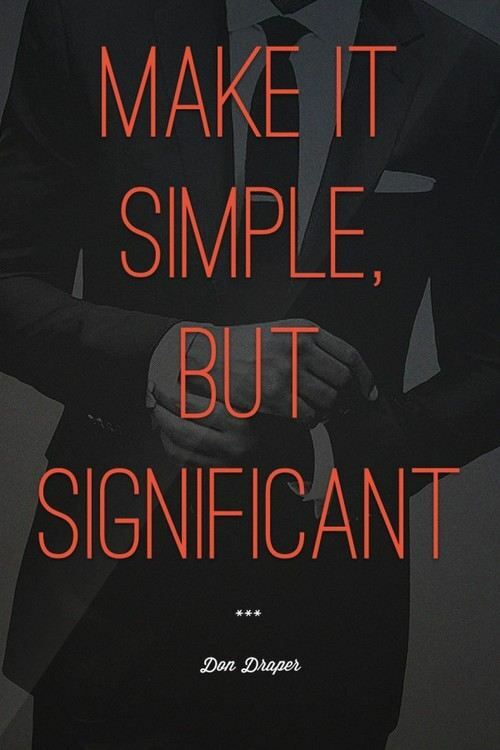 The most significant lesson I have learned in terms of a daily impact on my actions and decisions (and something to keep in mind if you take this plunge yourself) – it’s nearly impossible to get things done on the timeframe, quality level, and price bracket you agree to with a vendor. There are exceptions (cherish those), but this is the rule. Should be done in 2 weeks? Allot 4. Sign off on a sample? Expect something to go wrong. Enter in thinking amount $ABC? Add $DE and perhaps $F into your budget for last minute changes, expedited shipping, and all the extras that will be necessary to complete your effort. A key element of this – people will take advantage of you, lie to you, or just steal from you. It’s reality. Getting to spend the holidays with my family nearly six months into this journey was the most wonderful gift I could have asked for. I won the parent lottery, the sibling lottery, and my sibling’s choice of partner lottery. Of all the lotteries I won though, I know ultimately I won the wife lottery. 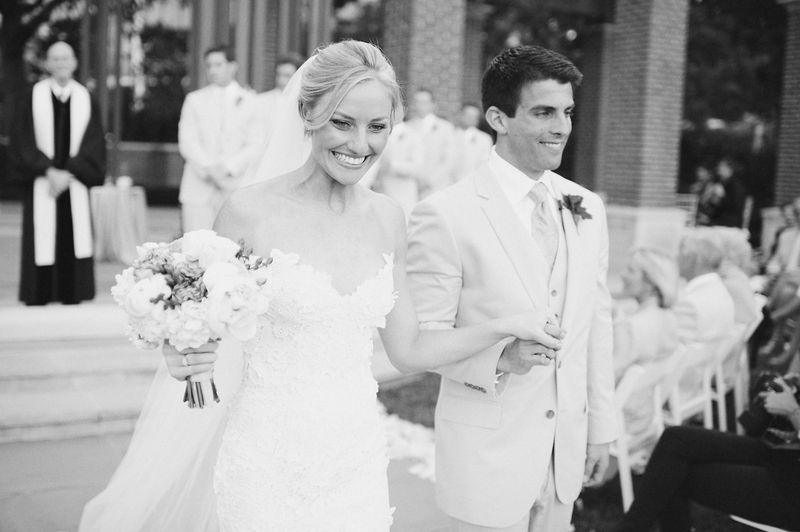 To have someone as graceful, strong, understanding, and let’s be honest, beautiful, as Jen… I am one very, very lucky man.